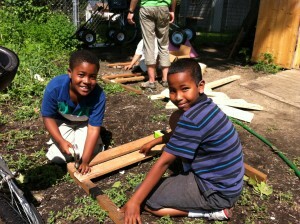 We have just wrapped up our second week here at Youth Farm and we had lots of fun. During morning garden time, we worked on our very first farm skill and some gardens even got to harvest some crops. On Tuesday, we took a very fun field trip to Como Zoo and had a picture scavenger hunt. It was another good week filled with delicious food made by our Youth Farmers and Nathan. We finished the week with an awesome scavenger hunt along the neighborhood with fun little activities along the way. It’s been a great week two here and we’re all looking forward to week three. Youth farmers work on a project at the main farm in Frogtown. HIRED liked this on Facebook. Ruby Simmons liked this on Facebook. Shannon Plath liked this on Facebook.